If you’re traveling through Northern Italy, you might encounter the picturesque city of Lecco. 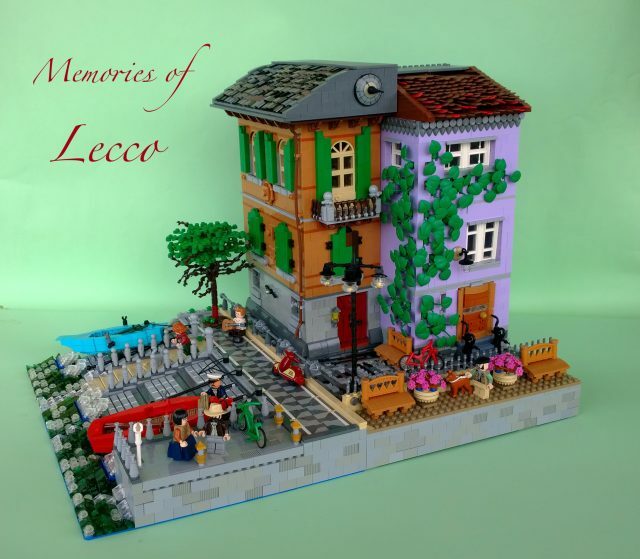 In his latest masterpiece, “Memories of Lecco”, Dario Minisini chose to model a representation of the city’s renowned waterfront architecture. I really enjoy the overall composition of this model, which has made an excellent use of color. The brown and lavender buildings make for an excellent contrast to one another, and the mixing of old light yellowish-gray and light blueish-gray bricks creates a vintage-looking patina that feels authentic. There is certainly no shortage of charm here. What makes Dario’s model so memorable is the amount of thought and effort that went into incorporating so much detail. A look at the tree with half its leaves missing suggests Fall must be right around the corner. Weathered-looking roof shingles are made possible with parts such as the boat oar, and the benches utilize classic Fabuland fences to great effect.